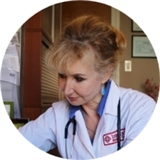 Dr. Inna Grishina (Brooklyn) - Book Appointment Online! I do not guarantee a cure, but I guarantee care My service is not free, but affordable for uninsured I guarantee enough time and attention to your problems You can always rely on my support and sincere care Patients’ interests are my highest priority More than 20 years practicing and teaching Welcome for a real doctor-patient experience I am a board-certified Internal Medicine - Primary Care physician. My career has given me a reputation amongst my patients, passion and dedication for superior patient care. I am very sensitive to ethnic, economic, social, gender, age- and privacy-related aspects of my patients’ care, and always strive to provide an individualized patient-centered approach. I always weigh the risk and benefit of every test and procedure. It is extremely gratifying to know that I make a difference in a patient’s life.